By not placing their pool table in the center of the room, this nice family is going to have space for other furniture in their upstairs gameroom. 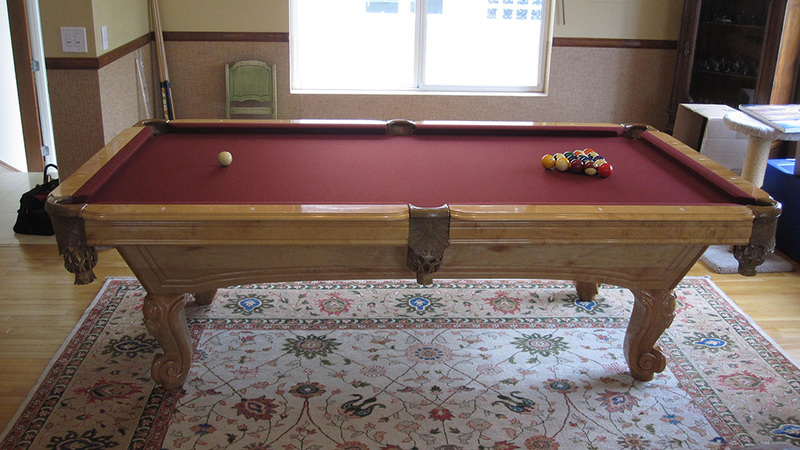 This 8′ Chinese import pool table was inherited with the purchase of the house, it was originally setup in another room. When our customer moved in they wanted to use the large room above the garage as their game room. When we arrived at this beautiful San Clemente, CA home, the pool table had already been disassembled and moved upstairs for us. Our job was to help our client choose the right felt color that would tie in their large area rug and surrounding furnishings. It was a toss-up between Burgundy, Mahogany or Brown cloth. Mr. liked the Burgundy, but after all the discussion it was the Mrs. choice of Mahogany that set the [cue] ball in motion. My assistant and I meticulously centered, setup/re-leveled and re-felted this 8 foot 3 piece slate, clear maple pool table in the perfect spot in the room. 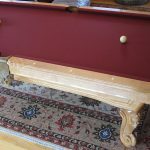 The only hiccup was in our zeal to maximize the space in the new game room this left one corner pocket pretty tight, but on the bright side I brought out a 36 inch “shorty” cue stick to alleviate the corner pocket conundrum.